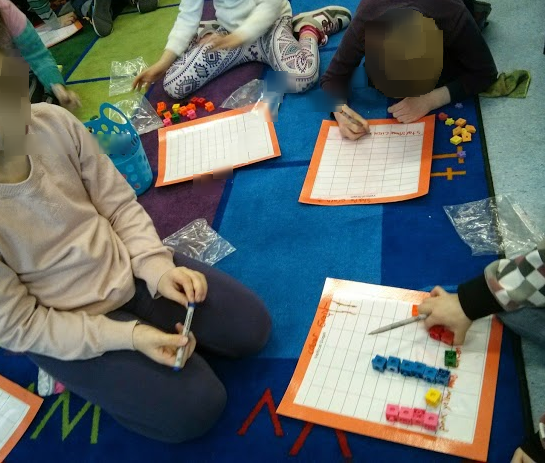 In grade two, in Alberta, students need to "construct and interpret concrete graphs to solve problems." I typically have had students do this outcome as a centre. Students create a concrete graph and then ask others at the centre questions about their graph. I typically do this centre with students twice. What I have had difficulty with this outcome is having time to properly assess it. So I decided to look at how technology could support assessment of this outcome. 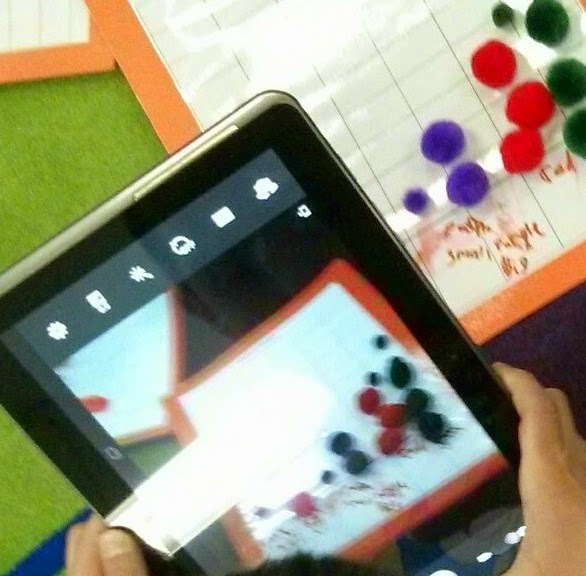 My first idea was to have students take photos of their graphs. This would allow me to capture their graphs quickly and assess them later. That way I could still move around the centre to assist students with their graphs or assist students in asking questions about their graphs. However, that did not address or capture the second part of the outcome: interpret concrete graphs to solve problems. So, I decided that students could write a blog post (we already had a class blog) about their graphs and ask people questions. The second step of the activity would be for students then to answer their peers' questions. I still had this as a centre (there were two other centres and students were at each centre for about 18 minutes). As well, I still had students do a concrete graph centre twice. The first time was just practice. The second day was when I had students take their photos. This meant that I only had eight students needing to take photos at a time. This is a manageable number! I have access to tablets in my school. So I took four tablets for this activity. On the back of each tablet I taped on some paper. As students took their photos, they wrote their names on the paper on the back of the tablets they used and how many photos they took. This helped me keep track of which photo went with which student. I uploaded all the photos from each tablet to a file on my computer I called "graphs" and I named each photo the name of the student. I then uploaded them all to the media library on Kidblog. This takes a little bit of time, but not a lot. Once the photos were in the media library, students could blog. I demonstrated to students how to access the media library. 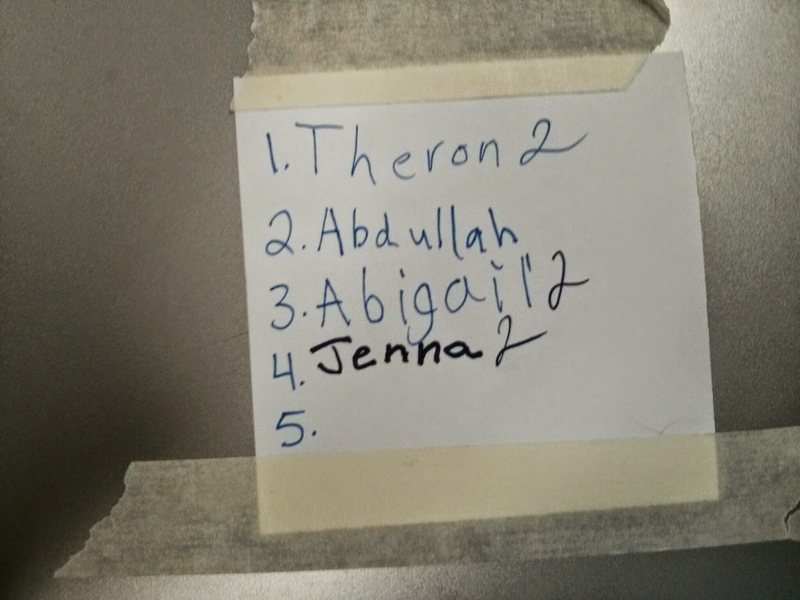 Then all students had to do was look for their name! Once they inserted their photo, they had to write a minimum of two questions about it. 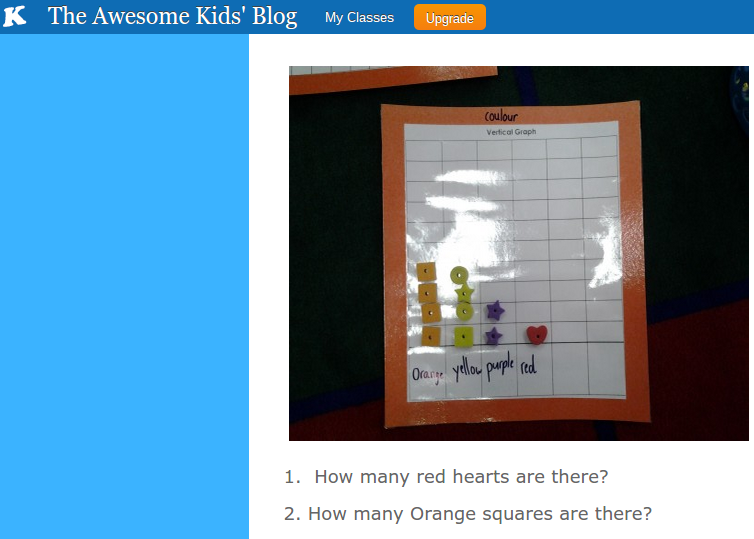 Before students could comment on each others' posts, I went through and approved each blog post. Some needed some editing before they could be published. I simply logged into Kidblog and had students do edits with me instead of having them log in, find their unapproved comment, edit, press update, etc. When all the blog posts were published, they were ready for the final step... commenting. I paired students up. 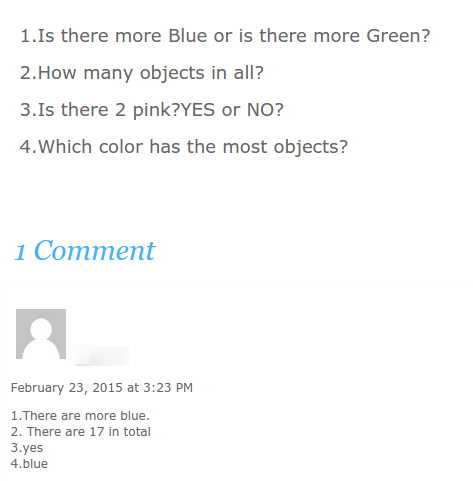 Each student had to comment on their partner's blog post. Students who finished early could comment on other graphs. Just like step four, I went through and approved each comment. Some needed some editing before they could be published. And just like step four, I did that by logging onto Kidblog myself and had students work with me one-on-one in a quick conference to make necessary changes. 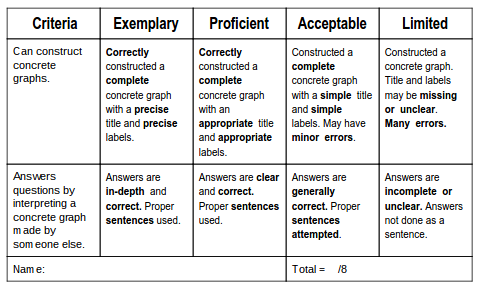 With my rubric in front of me, I logged onto Kidblog and assessed both parts of the outcome that started this adventure: construct and interpret concrete graphs to solve problems. The biggest problem that I ran into was during the photo stage. Students sometimes bumped their graphs and so their objects moved and no longer lined up on the graph paper properly. Some students did not do quality work and I did not notice until the photo was taken. So many students had to fix or redo their work and retake the photos. If I were to do this again, I would address this issue with students prior to starting the project and be more diligent in checking the graphs before students took the photographs. I had actually hoped to also get other people to interact with each student's blog post but I couldn't find any takers. Glare was also a problem as their graphs were on laminated paper. We ended up turning off some of the lights to help mitigate this problem. I liked this assignment. It definitely required more work from me than my previous centre activity. 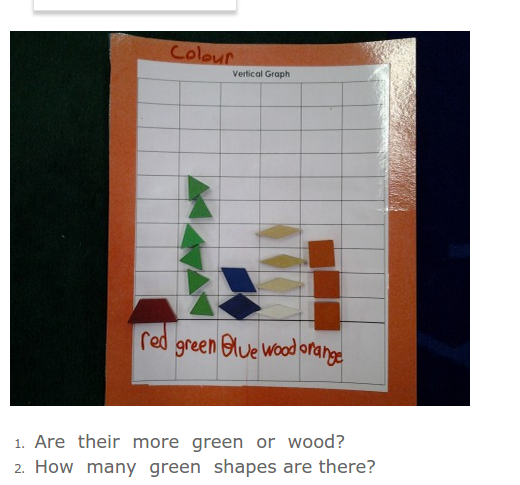 However I think it increased the amount students were engaged in thinking about what the graphs show and not just constructing them. I would definitely do something similar again. The photos did use up about 40% of my storage space on Kidblog (free account). I would like to have the activity have more real life relevance (a real problem for them to solve) or purpose but I have not come up with what they could do a concrete graph for to address that. . . yet. So I Joined Twitter. Now What?